Stainless steel pipe making machine with solid & rigid, stable under operation and adopts of ground & high precise gear driving spindle to lower the malfunction of the machine. Stainless steel pipe making machine is used mainly for producing different sizes of stainless steel round pipe, square pipe, and rectangular pipe. 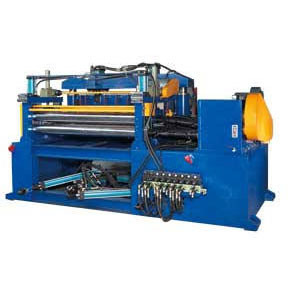 High Frequency Pipe Making Machine equipped with solid & rigid, stable under operation, and adopts of ground & high precise gear driving spindle to lower the malfunction of the machine. Advanced Computerized Numerical Control (CNC) plus AC servo drive technology together with fully automatic hydraulic controlled uncoiler that ensure our CNC Cut-To-Length machine to achieve you tough cutting job! Yang Chen Steel Machinery Co., Ltd. has been accumulating more than 30 years of manufacturing experience in supplying the stainless steel tube mill, high frequency pipe making machinery and its peripheral equipments. Until now, we've got outstanding reputations and widely patronages from domestic and overseas customers. We have a well experienced and seasoned staff capable of handling all of your challenging projects. Also certainly, we concern to meet our customers' requirement with effort. Copyright © 2013 Yang Chen Steel Machinery Co.,Ltd. - All Rights Reserved.